It just kept happening? We’re working the perennial gardens of the National Butterfly Center in Mission, Texas and then, a butterfly flies in from who knows where, and lands on a wildflower. Your brain does its 1/500th of a second discernment of the flight, wing shape, colors, patterns, flight braking technique, wing position on the flowerhead and then back fires the conclusion: New!! Yippee! Another new one. This one alighted on Mistflower blooms. I shot away. Weeks before this trip to the Lower Rio Grande Valley, I spent much time studying whatever field guide I had of butterflies west of the Mississippi River. I’m not sure that was a good use of my time, for when this baby made its stage entrance, I wasn’t sure of what species of Checkerspot it was. 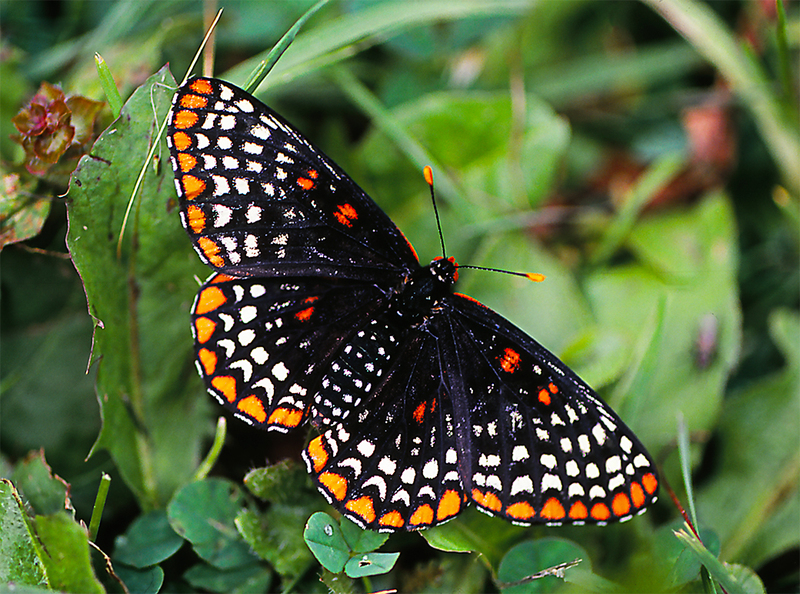 John offered that it was a Theona Checkerspot Butterfly. When the slides came back from Dwayne’s Photo in Parsons, Kansas, John’s ID was confirmed. My first meet-up with a Theona Checkerspot. The illuminated cells in the image are its saving grace. Theona, illuminated.